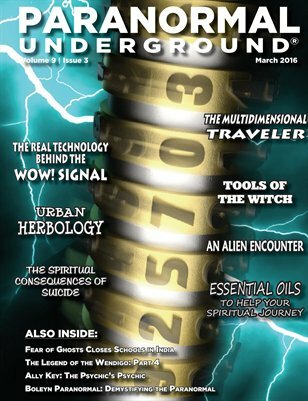 In this issue of Paranormal Underground magazine, we spotlight the UK paranormal group Boleyn Paranormal; Ally Key, the psychic’s psychic; and paranormal author June Lundgren. We also profile ghostly encounters at schools in India; if the real technology behind the WOW! Signal is really a secret NASA space program; and more about the legend of Wendigo and a personal experience. Plus, we discuss the multidimensional traveler, the spiritual consequences of suicide, using essential oils in your spiritual journey, urban herbology, dream interpretation, and talking openly about the paranormal. And don’t miss our features about the tools of the witch, an encounter with extraterrestrials, an investigation of a haunted liquor store, and paranormal safety issues. For a PDF download or 12-month digital subscription to Paranormal Underground magazine, visit www.paranormalunderground.net!